Happy Solemnity of the Immaculate Conception of the Blessed Virgin Mary! This feast brings joy and hope to all of us as we continue to draw new meaning and insights from the 200th anniversary of the Rule, written by Saint Eugene de Mazenod for the Missionaries of Provence, and of the first vows of those same missionaries on November 1, 1818. This feast of Mary also takes on special importance in this Year of Oblate Vocations, as every Oblate renews his commitment to work for vocations! The Immaculate Conception of Mary is a celebration that attracts us because we are fascinated by the beauty of the call to holiness. Pope Francis writes: “Holiness is the most attractive face of the Church.” (GE #9). The Immaculate Conception is also a mystery of God’s love that calls us to deepen our faithfulness to our missionary commitment. In this sense, as I will mention in this letter, the feast we are celebrating has a deep connection to the Synod on Youth, Discernment, and Vocation. As we celebrate Mary’s Immaculate Conception, we celebrate the vocation made by the Holy Trinity to every follower of Jesus: the call to holiness. Saint Eugene placed this call at the heart of our charism. “In the name of God be saints!” In his glowing Preface of 1825, he repeatedly invites us to strive with all our power to be continually converted, transformed, and transfigured by the gift of grace. He writes that, if we could be zealous and holy apostles, centered on Jesus, there would be reason to think that in a short time, the world would be converted to Christ. This we must constantly bear in mind: there is a direct relationship between the holiness of our lives and the efficacy of the ministry we do on behalf of God’s mission. 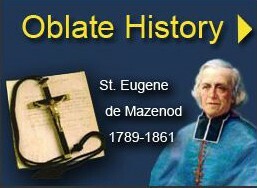 St. Eugene ardently desired that we live in apostolic communities to incite holiness among us: no smoldering wicks! If Oblates would be holy, there would be reason to believe that, in a short time, society, that had gone far astray, would be brought back to the Gospel. 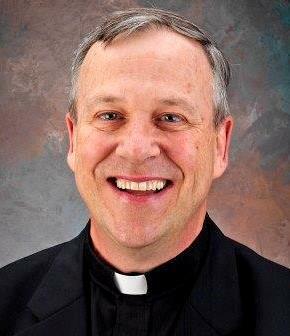 The rich fruitfulness of Fr. Dominic Albini’s preaching was attributed to the holiness of his life. We often have outdated ideas of holiness, and rather medieval ideas of what it means to be a saint. The recent apostolic exhortation of Pope Francis brings holiness down to earth. He speaks of an ordinary holiness of daily life: “We are all called to be holy by living our lives with love and by bearing witness in everything we do, wherever we find ourselves. 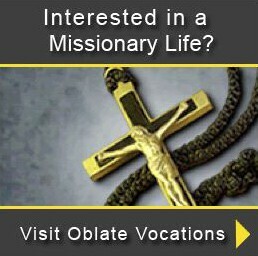 Are you called to the consecrated life? Be holy by living out your commitment with joy.” (#14 G.E.) Live our commitment with joy! What a revolution, when too often we live this with mediocrity, selfishness, divisions among us and lack of integrity. The call to holiness is found in simple gestures of love, forgiveness, acceptance of one another in apostolic community; in living our vow of poverty by a simple lifestyle, and by sharing all that is earned and received with my community; by a life of chastity, cultivating a pure heart, with transparency and unconditional love for all; by seeking to persevere in love, even in the face of weakness, discouragement, conflicts and disappointments. Holiness is based on a life of prayer and fed by the Eucharist each and every day. Holiness is serving the poor with patience and generosity in ministry. So many small ways are invitations to live in holiness by loving. Mary’s Immaculate Conception reminds us of this incredible call of the Lord, that we be transformed by God’s gift of grace. This feast not only recalls that our vocation is to become saints, but the prayers of Mary assist us on our journey of holiness. As Missionary Oblates of Mary Immaculate, we are called to nourish a tender devotion to her, whom we call the Mother of Mercy. She will help us grow in holiness. I want to emphasize that the feast of the Immaculate Conception is also a missionary celebration. Mary was saved from all sin and filled with grace in light of the mission the Holy Trinity had for her from all eternity: to become the Mother of God’s only-begotten son. What a missionary parallel for our lives! God invites us to holiness so that, in us, through us, and with us, God’s love will be revealed. We bear Christ to the world and become his presence to others, especially to the poor and most abandoned. Mary’s Immaculate Conception is not simply a beautiful honor and privilege for her for which we stand around her applauding and cheering! No, the beautiful gift of Mary’s gracing is all about the mystery that God hid from ages past and now revealed in the end times: the mystery of love for all humanity. We bear the name of the Immaculate Conception and we are commissioned as missionaries to bring Christ into the world, not settling for a bland and mediocre existence (GE#1), but fully charged with the glory, the love and the mercy of God. What a marvelous call to be cooperators in God’s saving plan! A final word: on our feast day, we cannot overlook the recent Synod on Youth, Faith and Vocational Discernment. The celebration of the Immaculate Conception of Mary also celebrates the reality that God chose for his dwelling-place the body of a poor, young, Jewish woman, Mary of Nazareth. The glory of God moved away from the Temple and took up residence within the womb of a young maiden from a marginalized family! It was in Mary that God chose to reveal his preferential love for all humanity, beginning with the poor. Mary’s Immaculate Conception commits Oblates to the mission of preaching the Gospel to the poor, to and with young people, and to those most excluded by society. On our 200th anniversary, the 2016 General Chapter affirmed and strengthened this call in faithfulness to the charism. The recent 2018 Synod reiterates this vocation: we must listen to the signs of the times in the excluded, the poor, and all the marginalized of our society. There we see the faces of the poor who cry out for salvation, which can only be found in Jesus Christ. This is the place in which the Trinity reveals God’s call to mission for us today. Our Lady’s Immaculate Conception is not a triumphalistic dogma of a bygone theology, piety or spirituality. 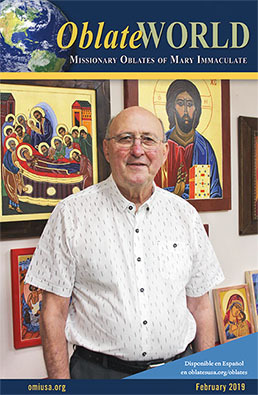 It is a Christo-centric and faith-filled missionary belief of the Church that reminds us Oblates, that like Mary, we are called to a profound holiness of life, and this is intimately connected to mission to and with the poor. We can never give up believing in this ideal of holiness, because it is the gracious initiative of the Trinity. Our patronal feast calls us to again strive for holiness, and to renew our missionary commitment to the poor. We know how much Saint Eugene delighted in this belief in the Immaculate Conception of Our Lady, which he learned about as a young child in his catechism class in Aix-en-Provence, even before the dogma was defined by the Church. He advocated passionately for the definition of this dogma, and rejoiced with childlike enthusiasm and joy when Pope Pius IX proclaimed the dogma of the Immaculate Conception on December 8, 1854. Saint Eugene was there! As the family of Eugene, let us too be filled with rejoicing and gladness on this day, celebrating our Mother and honoring her with great joy and happiness. Happy feast day to all!